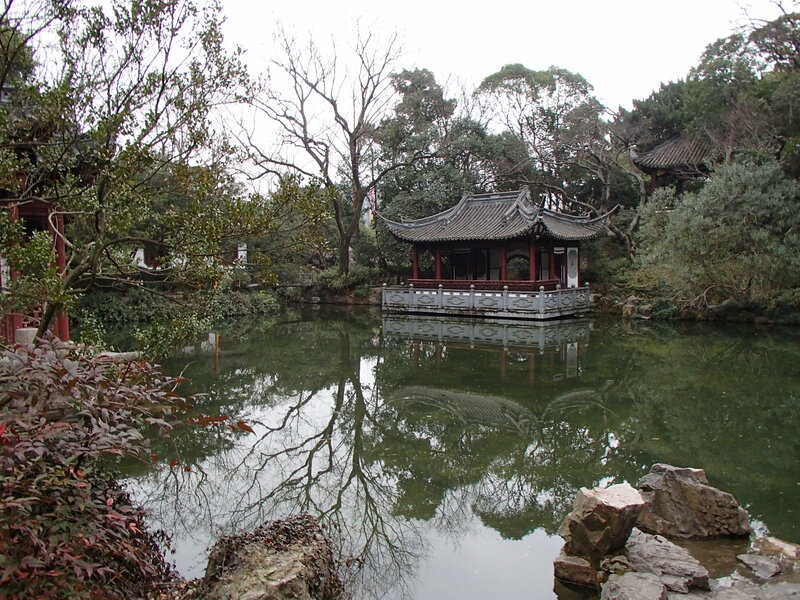 The last two Saturdays we have gone on walking tours with Historic Shanghai. 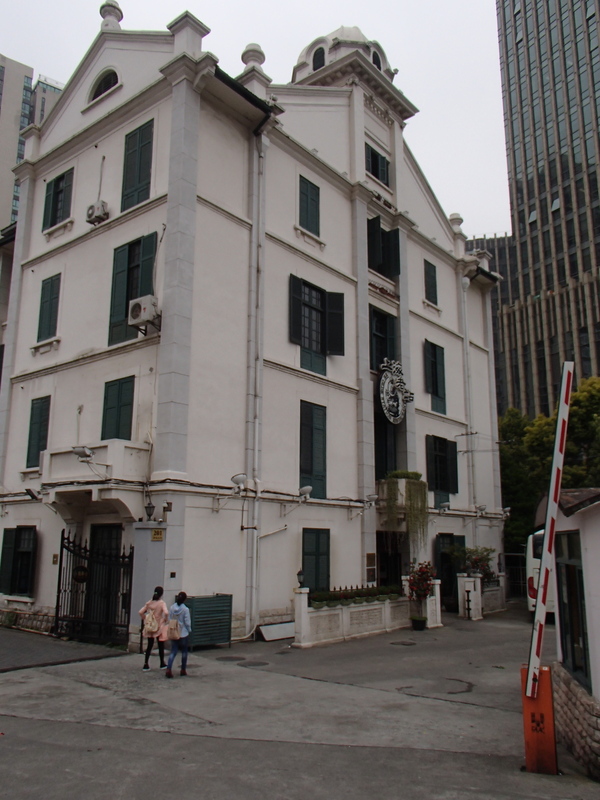 The first included the Jesuit buildings of the Xujiahui area. Background information: Father Matteo Ricci came to China in 1582. 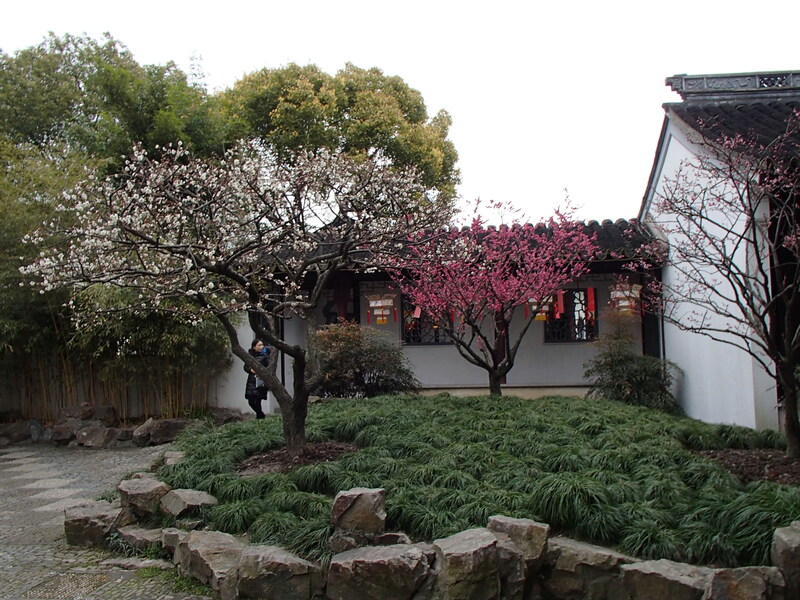 He learned Mandarin Chinese and formed a strong friendship with Xu Guangqi, a scholar and political figure. 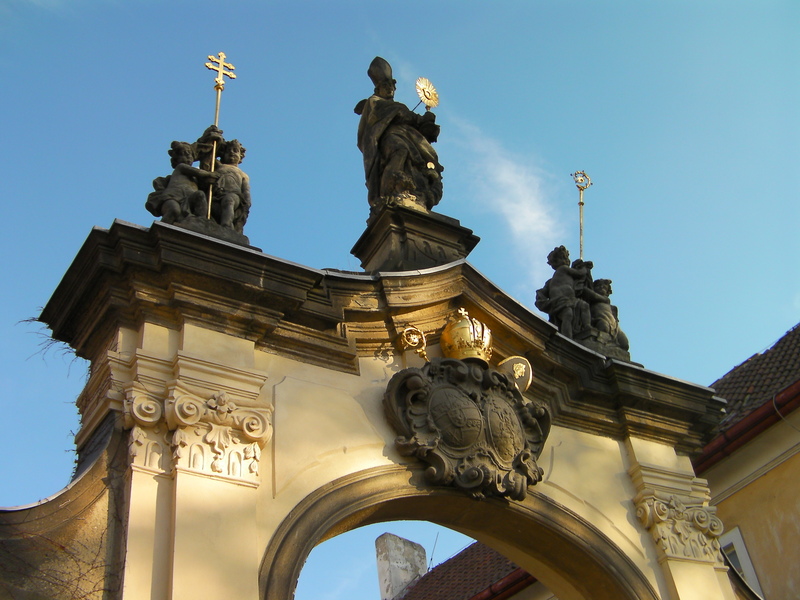 The Xu family donated land to the Jesuits who built a cathedral and many related buildings. We began in the Virgin Mary Convent which is now a restaurant. It is very close to the original condition because it was a convent until the 1990’s, so remodeling has been minimal. We began with a lunch composed of traditional Shanghai dishes. All yummy, well, except for the spicy peanuts. The tour included the convent, the College of St. Ignatius, the biblioteca (library), the cathedral, the observatory, and the orphanage. 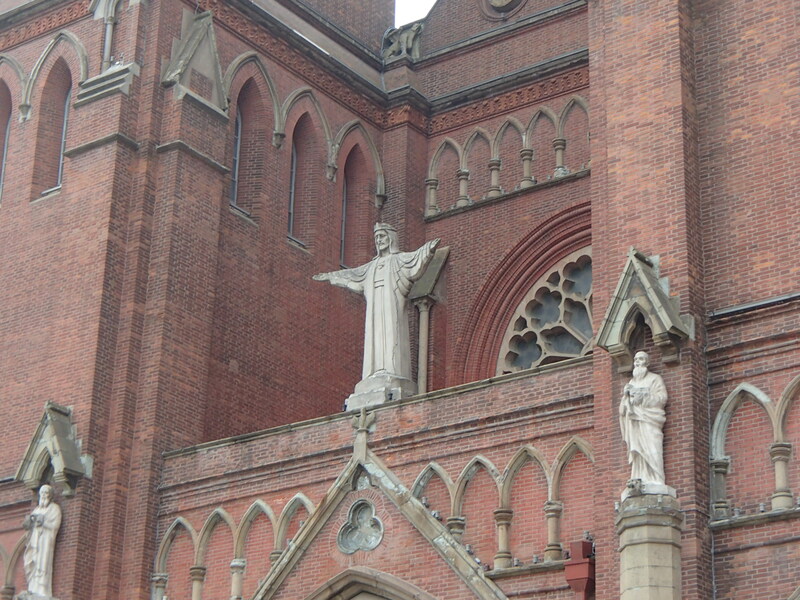 There were many more Jesuit buildings in this area, but these are all that remain. 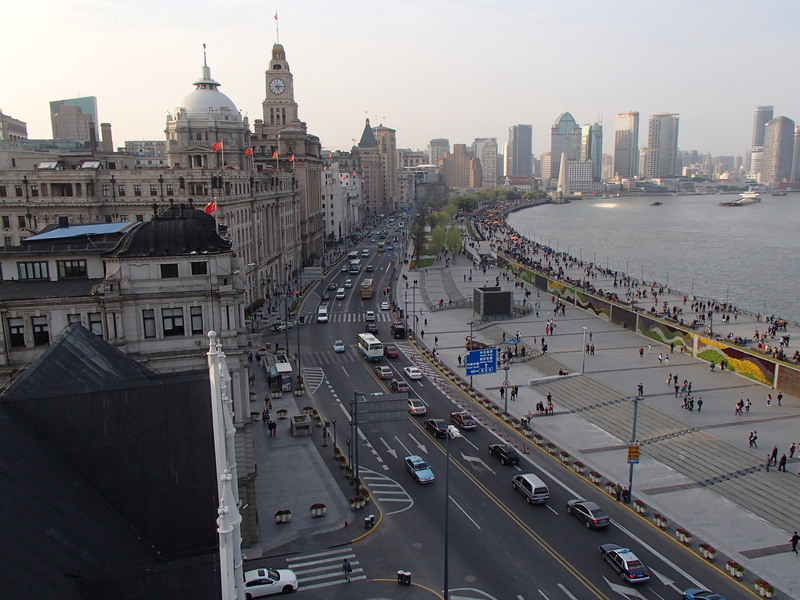 The second walking tour was of the Bund. This is on the bank of the Huangpu River. 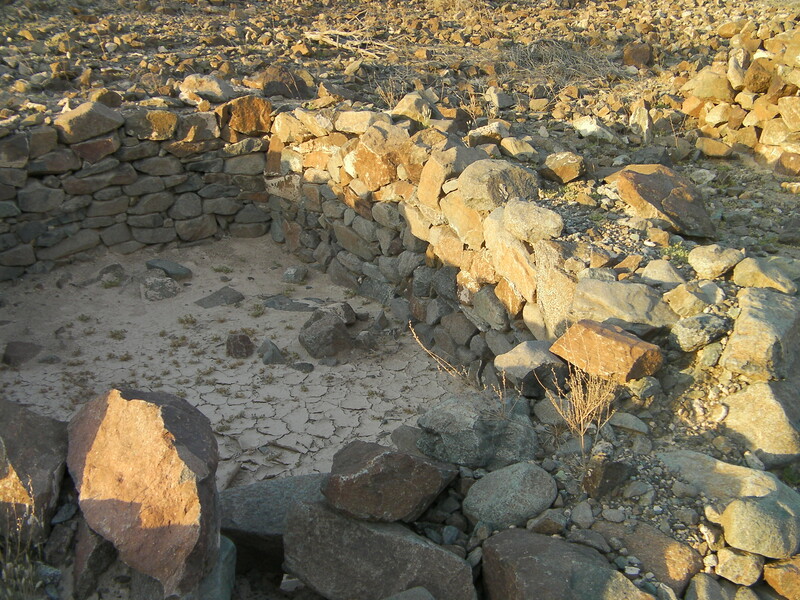 This was the center of the Western business trade. There are several generations of buildings, beginning with late 1800’s to the present day. We began at the former British Consulate and walked south to Bund #1 the Asiatic Petroleum Company building which is currently vacant. I have included pictures taken before and after the tour while walking from and back to the metro station. We spent the afternoon in Guyi Garden. It was a long taxi ride (76 yuan – $12 USD – 45 AED). 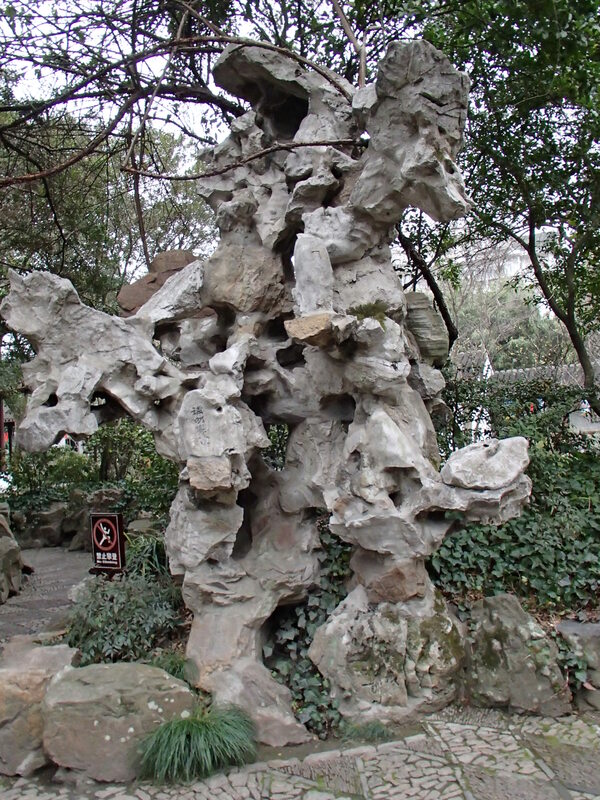 The admission is 12 yuan per person ($2 USD – 7 AED), so getting there is the expensive part. There is a metro station, but it is a bit of a walk. We took the metro home, but it was easier to find the place by taking a taxi. 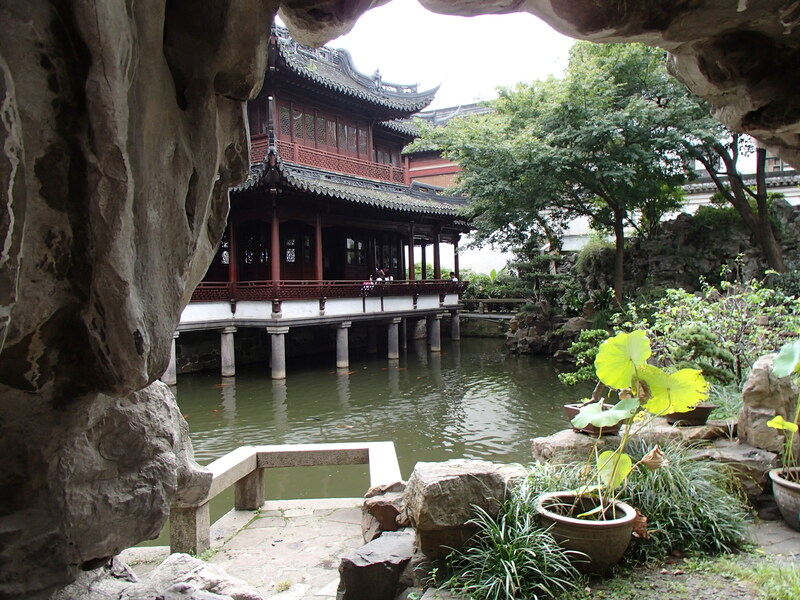 The garden dates to the Ming Dynasty, as does Yuyuan Garden. It has been renovated multiple times since then. 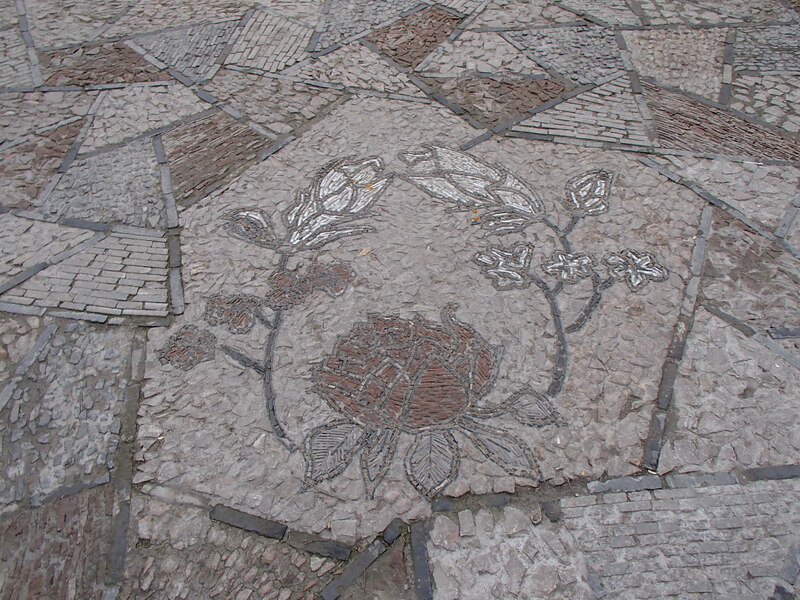 There is art everywhere – in the stone walkways, in the ceilings of every structure, and in the stone structures. The beauty of nature is not overwhelmed by the human art. They really knew how to balance and co-exist with nature. Spring is beginning. Trees are beginning to bloom. To see all the pictures – click here. Every good day starts with a good breakfast. It is difficult to find a truly good American style breakfast while living abroad. Some UAE restaurants would list “American breakfast” on their menus and when it came, it included baked beans and a grilled tomato. NOT American. Not having any eggs in the house, we got up and walked to “foreigner street” where there was supposed to be a restaurant with a good breakfast. The first good sign was that the menu was on the placemat. It is a weird, tacky thing we Americans do. The second good sign was that the menu indicated I could get refillable coffee. That’s big on my restaurant critique scale. DaddyBird ordered steak and eggs with blue berry pancakes and I ordered the breakfast combo (two eggs, hashbrowns, bacon, toast, and fruit). The blue berries were IN the pancakes instead of just poured on top. My coffee was actually refilled twice and the hashbrowns were so good that I ordered another helping. The service was as good as the food. The review DaddyBird had read that led us here indicated that the crispy bacon would actually be crispy. This was very true. Five stars to Bastiaan’s. We will definitely be return customers. We hopped on a bus which took us to the metro train which took us to the neighborhood of the garden. It is a bit of a walk from the train to the garden. Along the way were a few beggars. DaddyBird usually drops a few coins or small bills in their cups. This brought him to the attention of a young Chinese man walking the same direction we were. He struck up a conversation with us, one that I began to fear wasn’t going to end. It became clear that he wasn’t just being sociable, but had a shop that he wanted to take us to, not just one shop, but several. We went and it was worth it. The first shop was silk products, but the hook is that they have a “museum” which is actually just an educational display on how silk is made. It was very educational. Silk is rather amazing. After the “museum” came the shop with bedding, scarves, and clothing – all silk. DaddyBird tried on a shirt, but their largest size was just a bit too small. The same with me. I tried on a really lovely jacket, but needed a bit more room. So, they had to settle for selling me scarves which have no size constraints. THEN he wanted to take us to his family’s tea shop. We thanked him, but made our excuses and moved on. 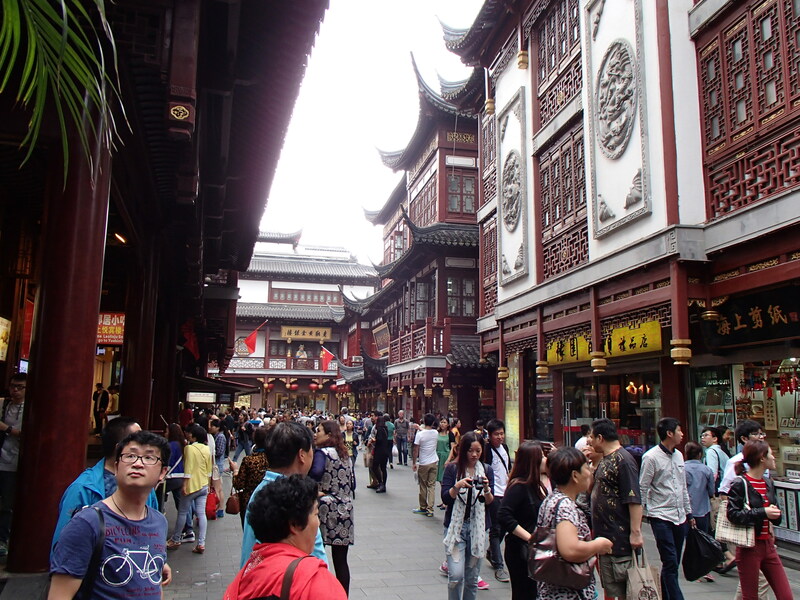 The area around the Yuyuan Garden is a busy maze of consumerism. 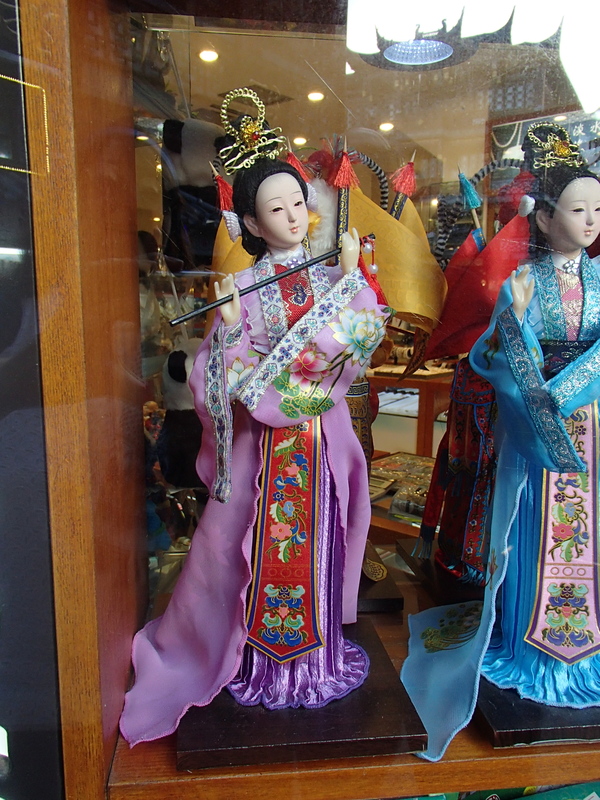 There are many shops full of marvelous things, as well as dumpling shops, etc. We finally reached what appeared to the be garden. This is what often appears on the advertisements. We both thought, if this is IT, what a disappointment. There were plenty of other people in the garden area, but it was still a pleasant and relaxing experience. There were places to sit and enjoy the fish, turtles, birds, and nature. It is an amazing little bit of serenity in the middle of a highly urban and populated city. 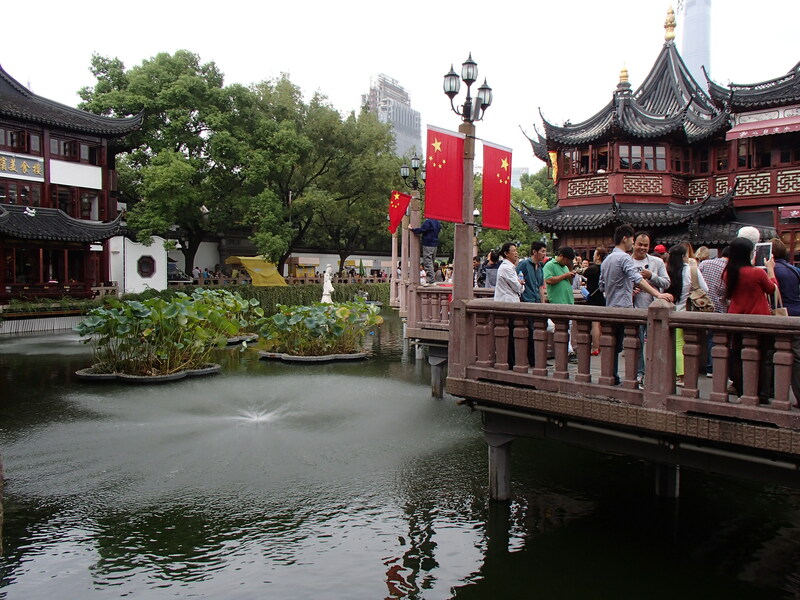 The garden is a large area with many buildings, gardens, and winding paths connecting them all. One building housed a few tea shops. If you know DaddyBird and his tea addiction, you know that we went in, sat down, sampled 4 or 5 teas, and bought two boxes of the best teas. Expensive, but worth the experience. Another building housed artworks for sale. They were quite amazing, but we refrained. As I mentioned earlier, we had to exit in order to find something to eat, so it was back out to the tourist mart area, hustling and bustling. 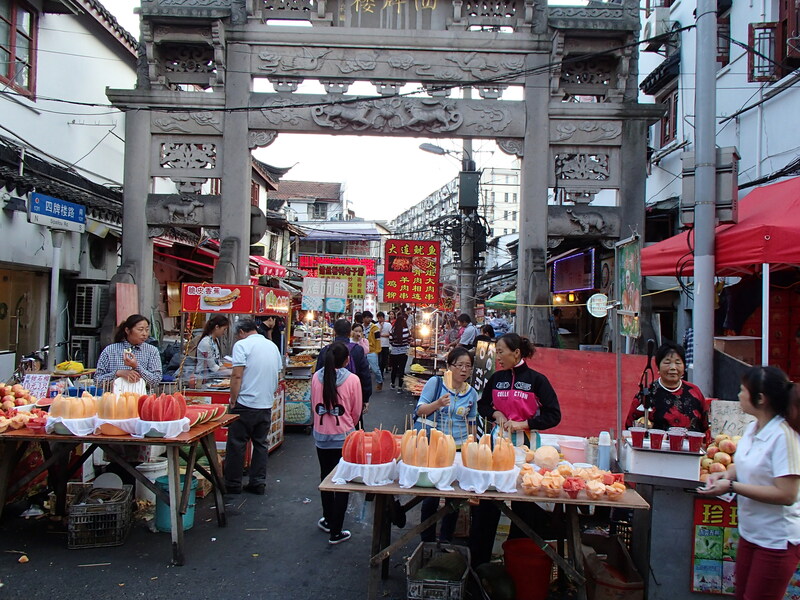 We are used to tourist areas where the merchandise is cheap stuff (made in China) and the wares of each store are almost identical to the wares of their neighbors. This is not true of the Yuyuan Tourist Mart. The wares vary from store to store and there are quality items that you might actually want to buy. I suspect we will have little trouble finding Christmas gifts this year. 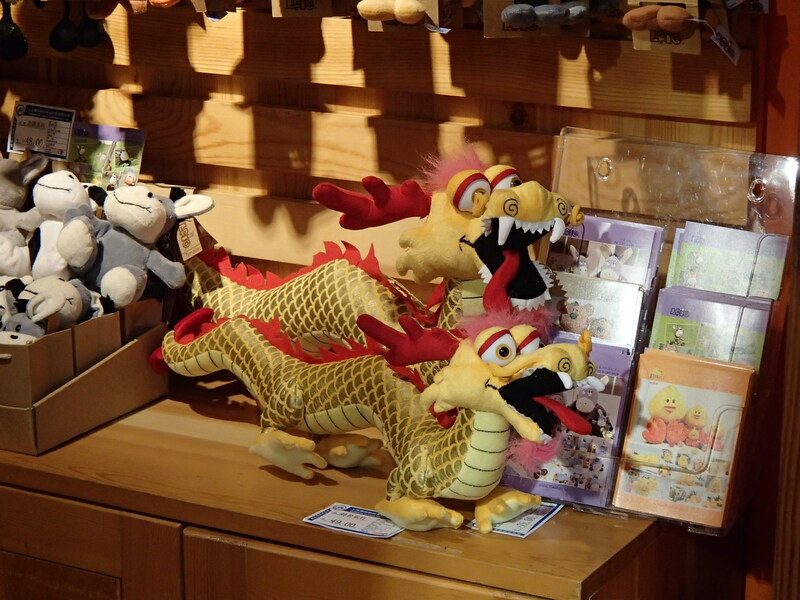 These dragons are pretty spectacular as plush toys go. We walked a short way to Fangbang Lu (street) which is known for it’s food vendors. We walked down the length looking at what was available and then came back through to actually make our purchases. I had decided that I wanted to try stinky tofu, so we began with that with the idea that if it was terrible, we could cleanse our pallets with something else afterward. 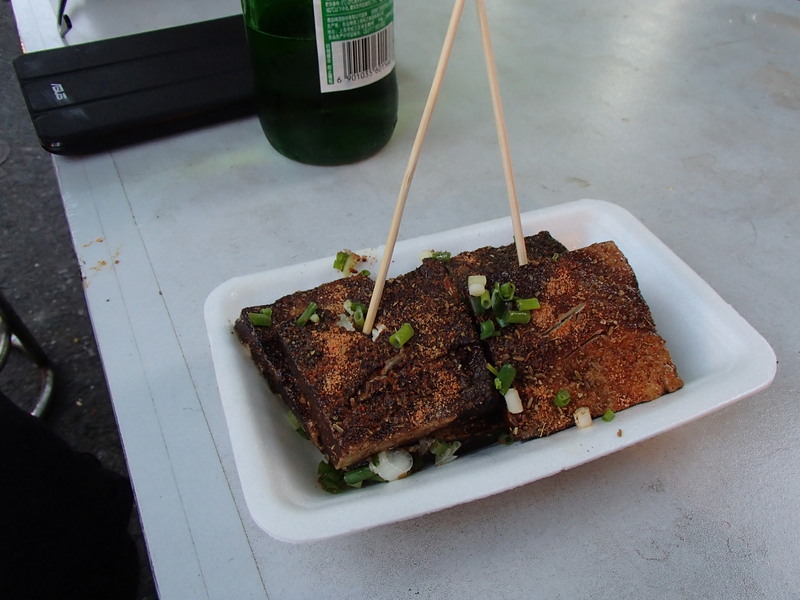 Stinky tofu, we can attest, smells like poo. For DaddyBird’s tastebuds, it also tasted like poo. Mine, however, reacted differently and I found it pleasant and almost pedestrian. Therefore, I ate the bulk of the stinky tofu. We followed this up with noodles and bok choy and discovered we were full. 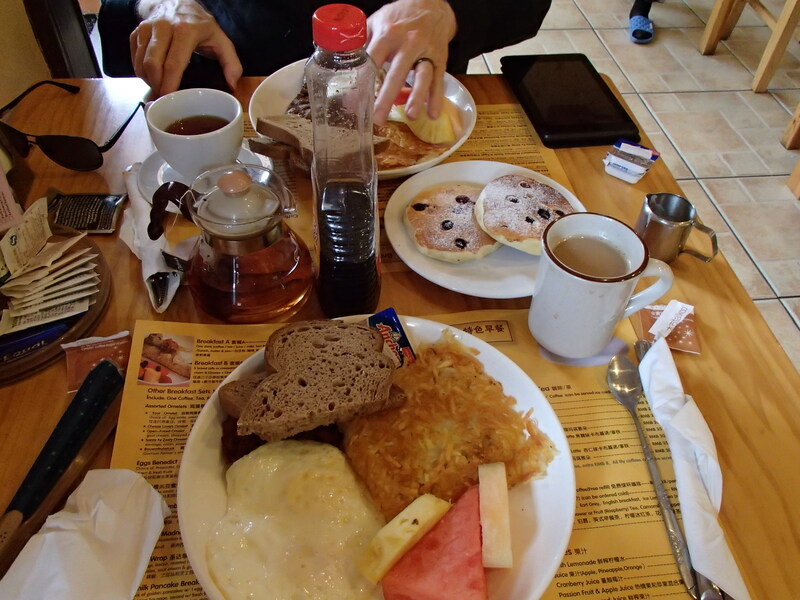 There were many other enticing tidbits on offer, so we will have to go back without having a big breakfast first. I took many, many photos, so click here if you want to see them. Posted by Kanga Please do not reblog. 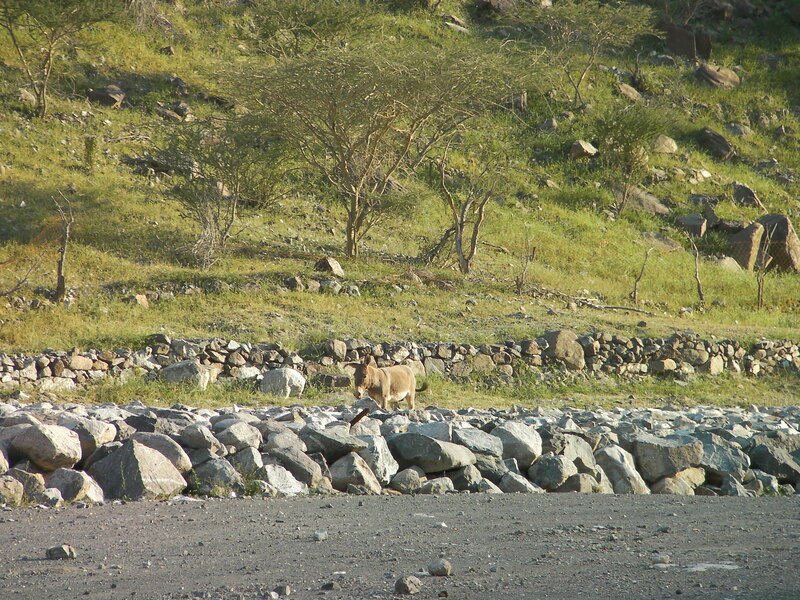 On our way home from Dubai one day while it was still light out (which is rare for us), we took the Esfai turn off to see what there is to see. 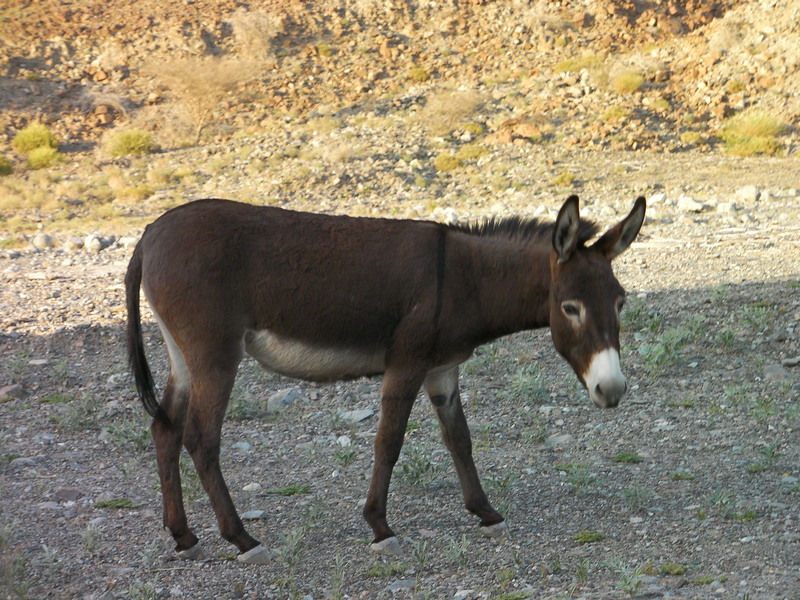 Feral donkeys are common in the mountains and usually travel in multiples of two. 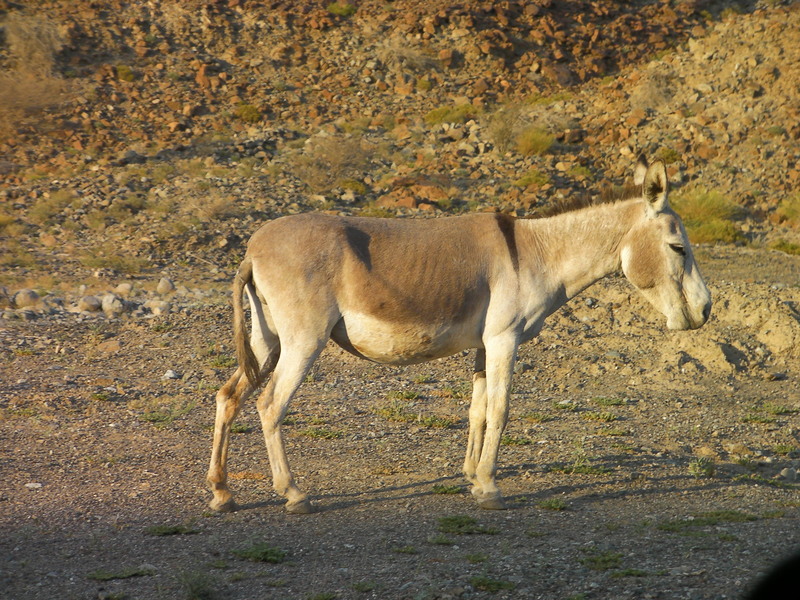 This one is unusually pale in color and seems to have a foal in the oven, so to speak. I assume her traveling companion is the sire. They have had a bounteous year with the winter rains resulting in more grasses and bushes to eat. We briefly explored the remains of the old village. There are newer modern houses further up the valley, but these are more interesting to us. 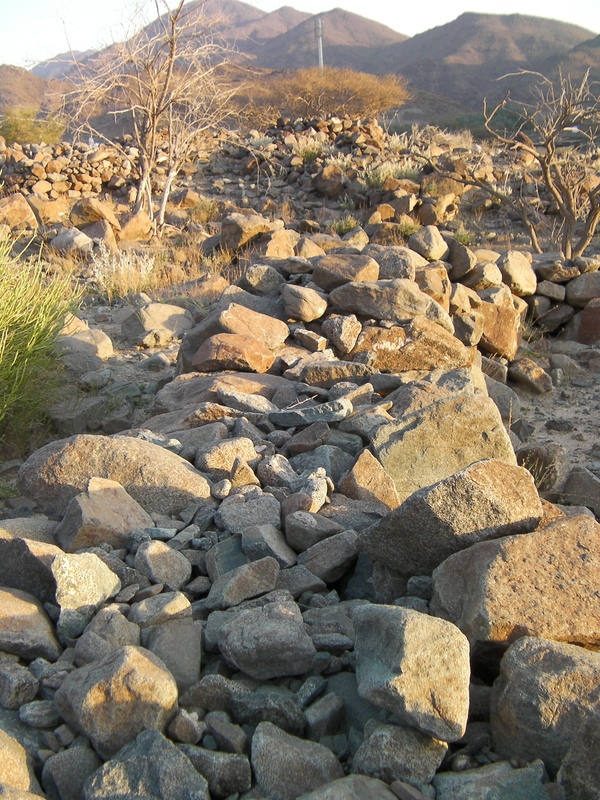 Many of the structures had double rock walls – large rocks on the outsides of the wall with gravel filling the gap between. Very strong, I should think. Here’s a closer view, although the filler rocks in this one are larger than gravel. 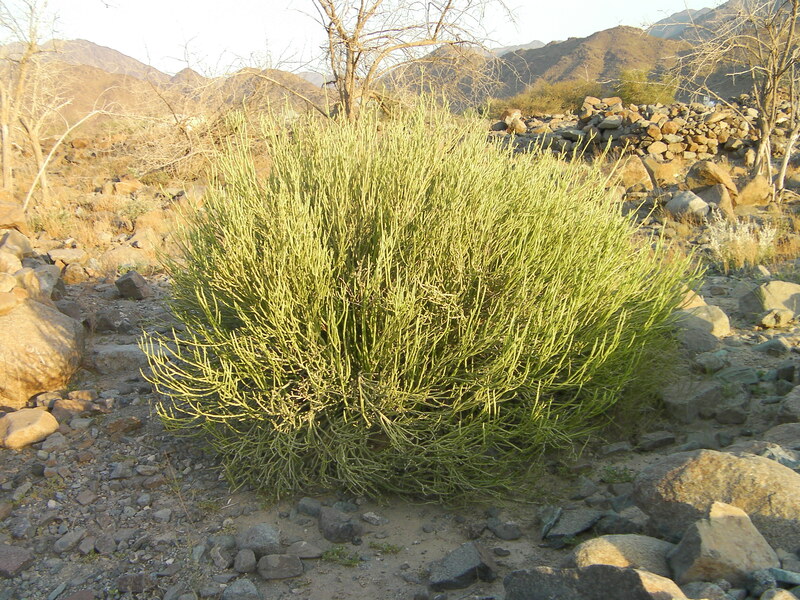 This bush is proof of the wet winter. It is about a meter high. For all the pictures, click here. 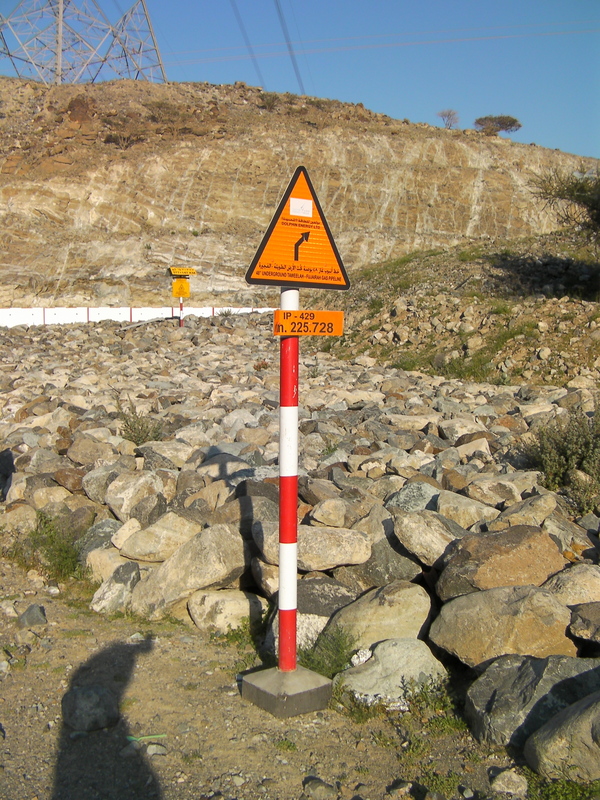 If it seems odd to you that this would be in Ras Al Khaimah, that is because the emirates are not necessarily contiguous. 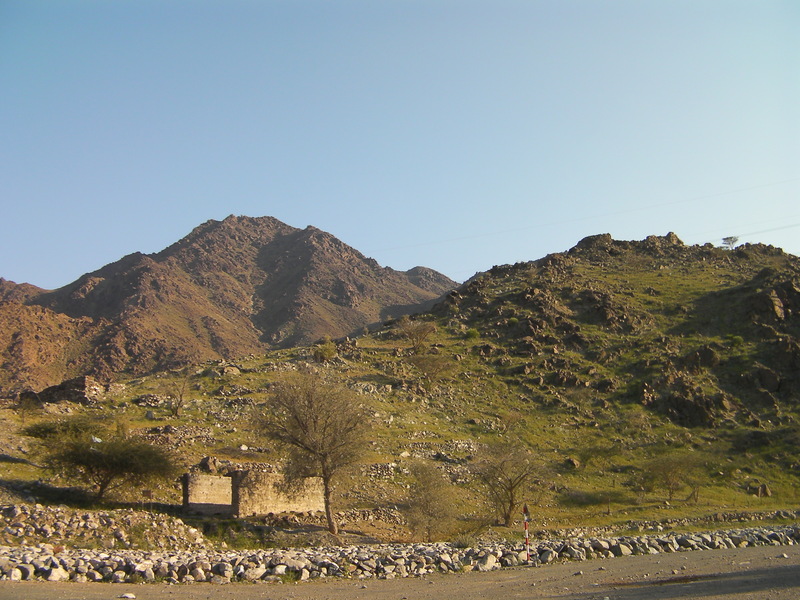 RAK is actually in two large, but separate areas. This map shows the layout of the emirates fairly well. 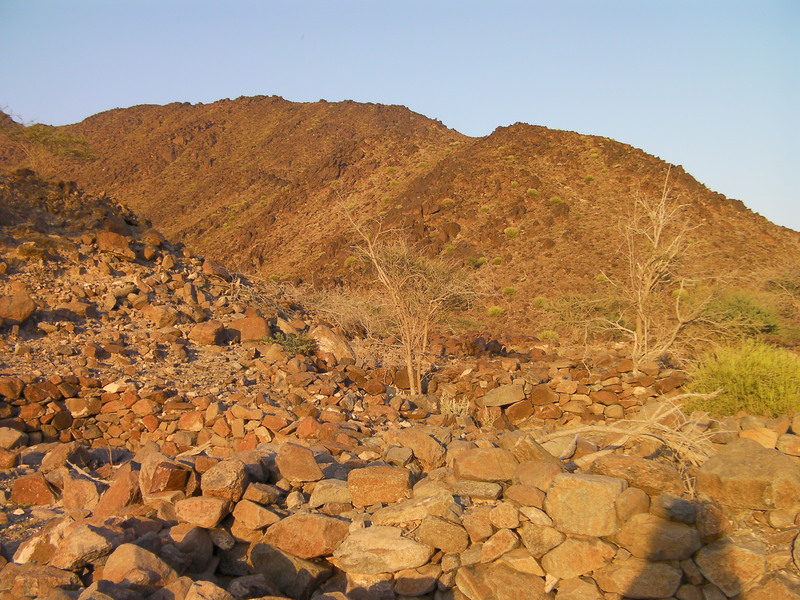 We drive through Fujairah, Ras Al Khaimah, and Sharjah to get to Dubai. We traveled on many trams today. We walked a long way today. We did many things. We saw many sights. We are tired. I think I may just crawl onto the airplane tomorrow and pass out, if it weren’t for the discomfort of economy class. 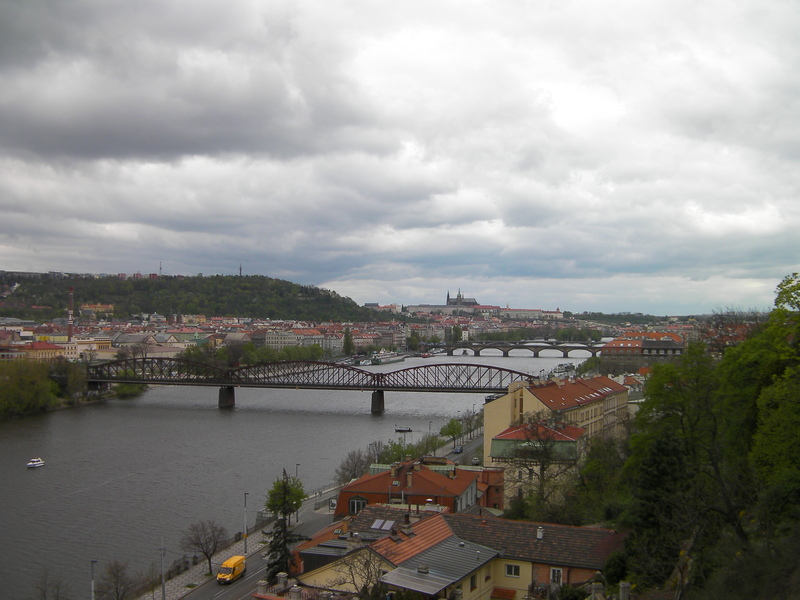 We took trams to the base of the hill on which the Vysehrad Park is and walked up the hill. We walked all around the park and took many, many photos. 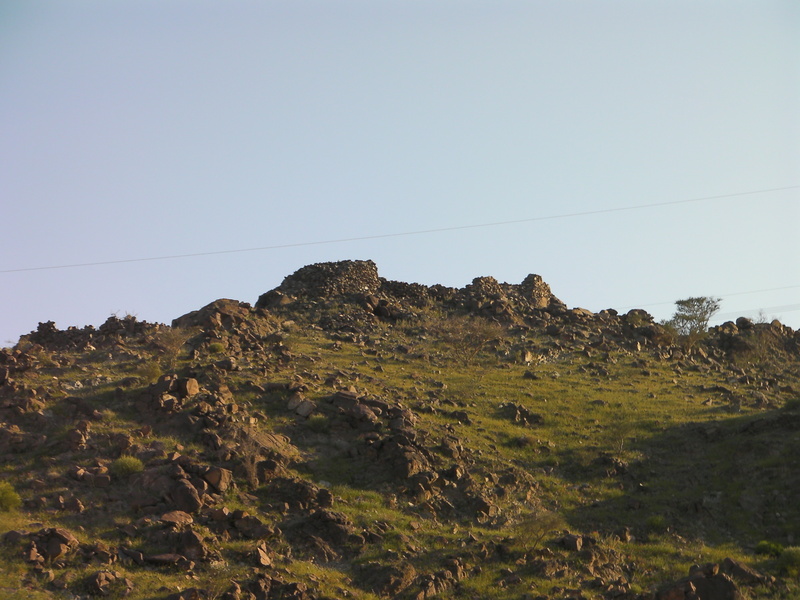 We then walked down the hill and took a tram again. DaddyBird had scoped out a particular pub he wanted to have lunch in, but it was either closed or located deep in the basement. We couldn’t figure it out, so went to the Indian (Native American, that is) themed Baretta Pizza place instead. The whole place was decorated in wild west artifacts and pictures. The food was very good. We recommend. Then we got on another tram and went closer to the center of town to a bookstore where DaddyBird hoped to find an English translation of a particular Czech book. No dice. Before the end of the day we went to two more bookstores and finally found it at the last one. Then we went to a touristy trap pub. It is known for it’s surly staff, bad food, but good beer. It is all true. Then, back on a tram to Wenceslas Square to finish our souvenir buying and have a fried cheese sandwich. And, finally, onto another tram to go home to the apartment and collapse. To see it all, click here. We took the tram up to the top of the hill and walked down to the castle. 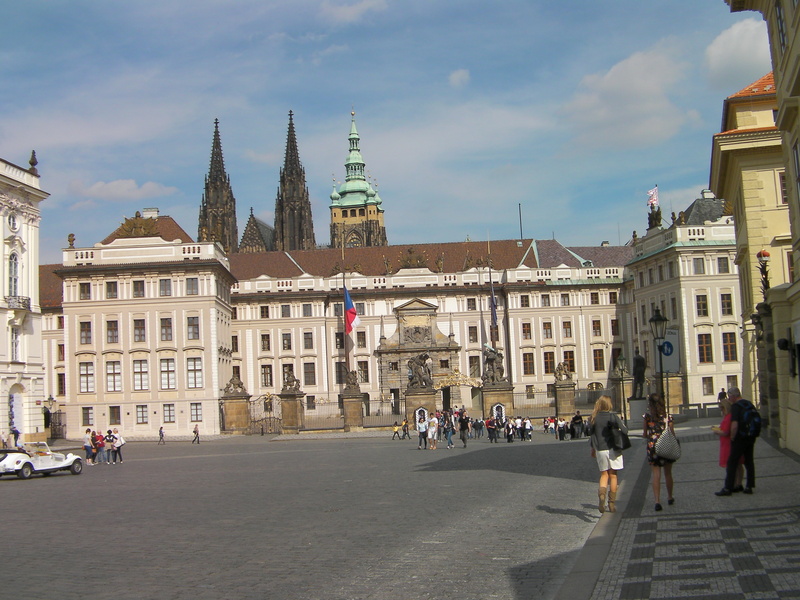 (Interesting point of information – the castle is still used as the seat of government and the presidential residence.) Click here to see all the pictures. Click here for a map of the castle grounds. 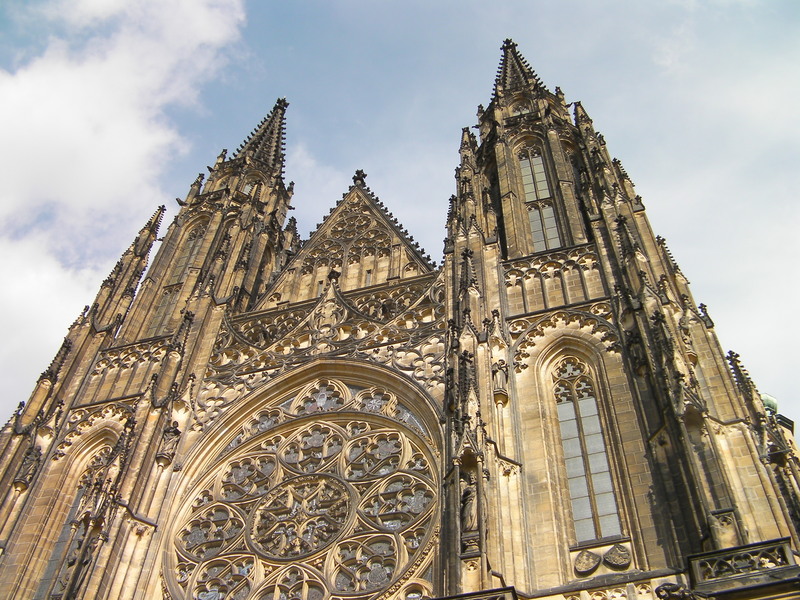 Within the castle grounds is St. Vitus Cathedral. To see the interior photos I took, click here. 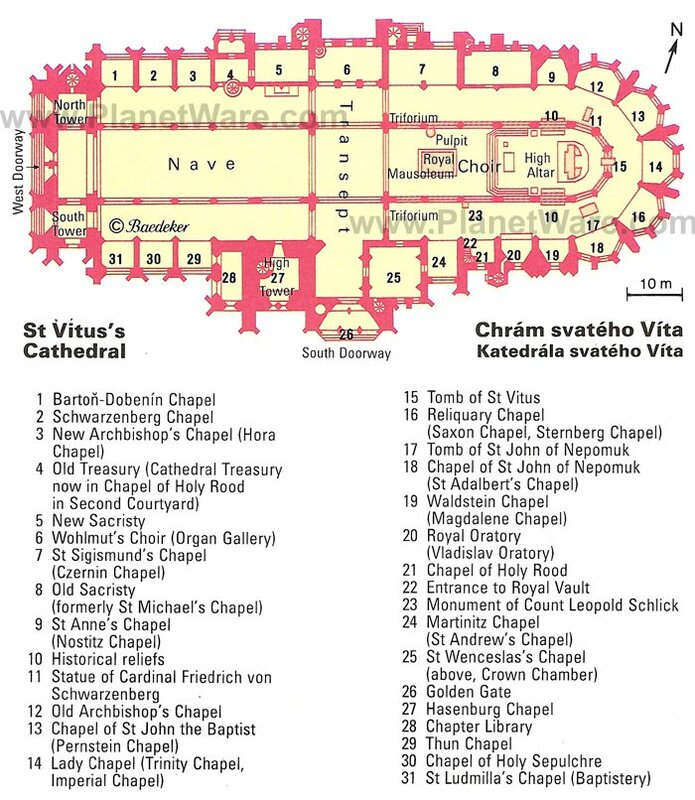 Click here for a map of the cathedral. 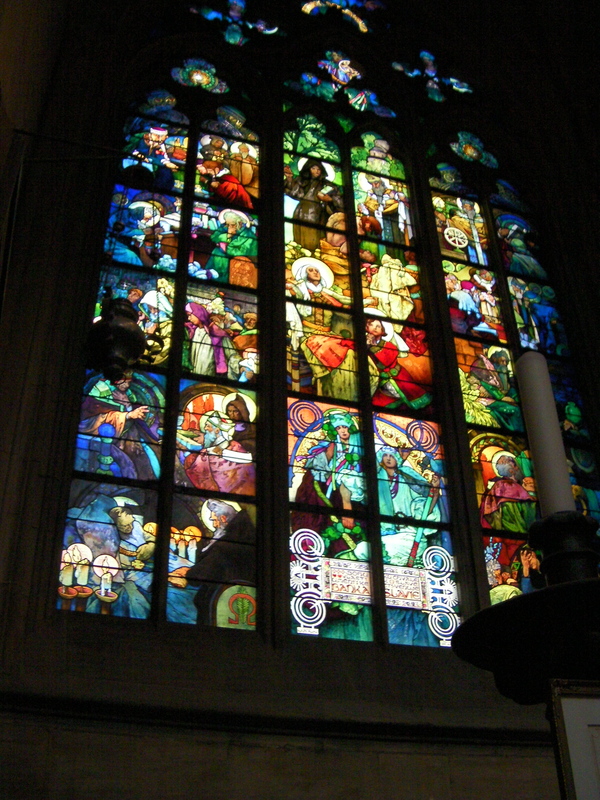 Many beautiful stained glass windows in many different styles. 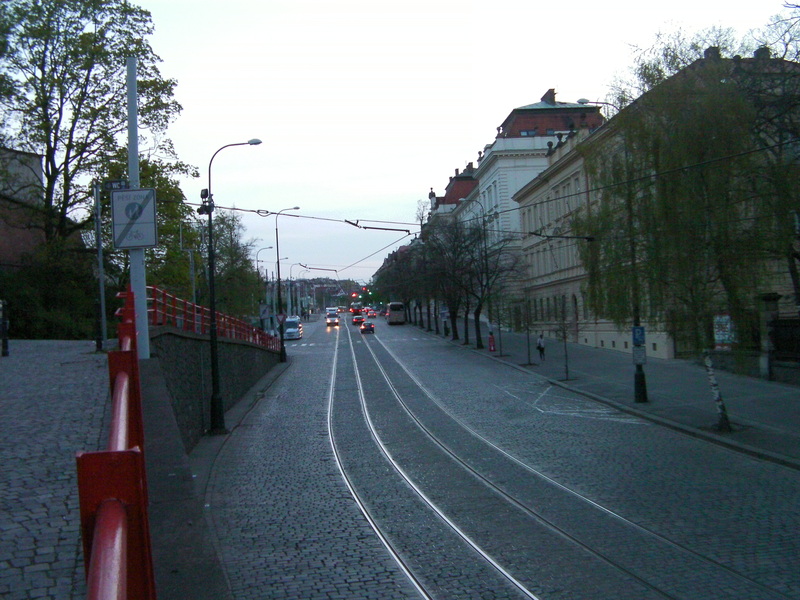 After touring the castle grounds and walking down the hill to the tram stop, we took the tram back up to the top again so that we could have dinner at the Strahov Monastery. We ordered goose and duck. The goose entré was the best. The duck was good, but not as tender and lovely as the goose. 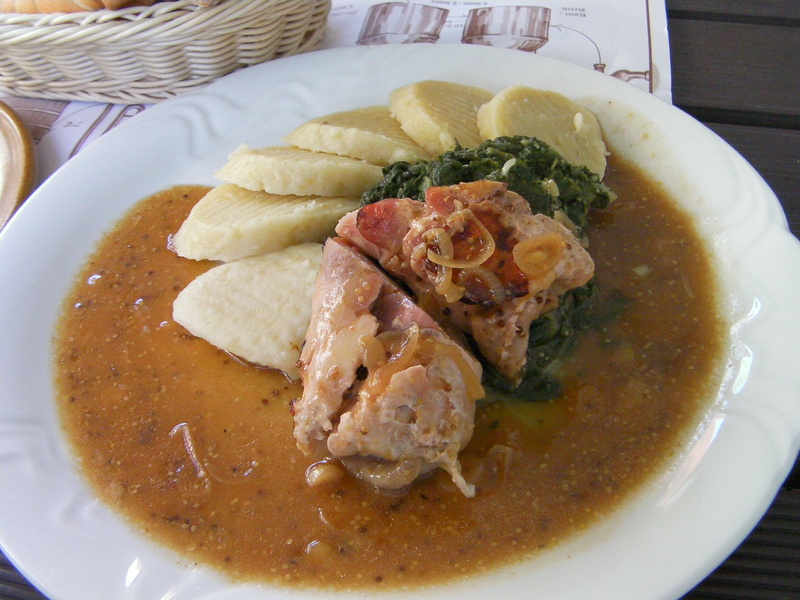 The chef didn’t seem to know what to do with spinach except cook it to death. 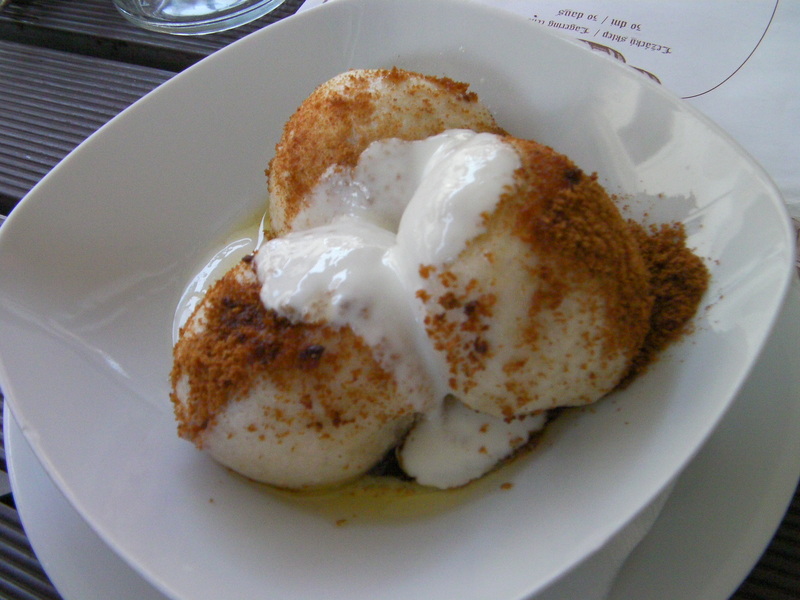 I ordered stuffed gingerbread dumplings with plum sauce. The dumplings were not made of gingerbread, much to my disappointment. 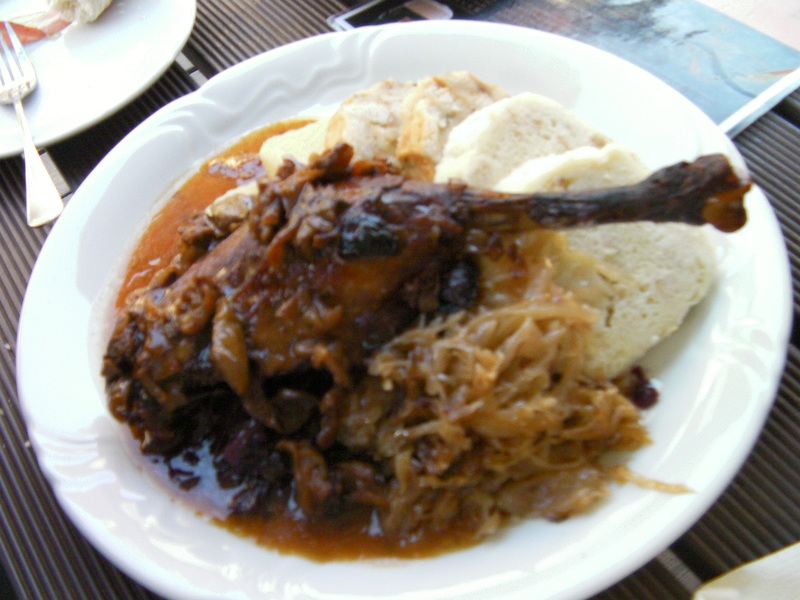 I am not impressed with Czech dumplings, whether savory or sweet. They are tough and tasteless. Inside was half a plum and the plum sauce was delicious, so it wasn’t all bad. 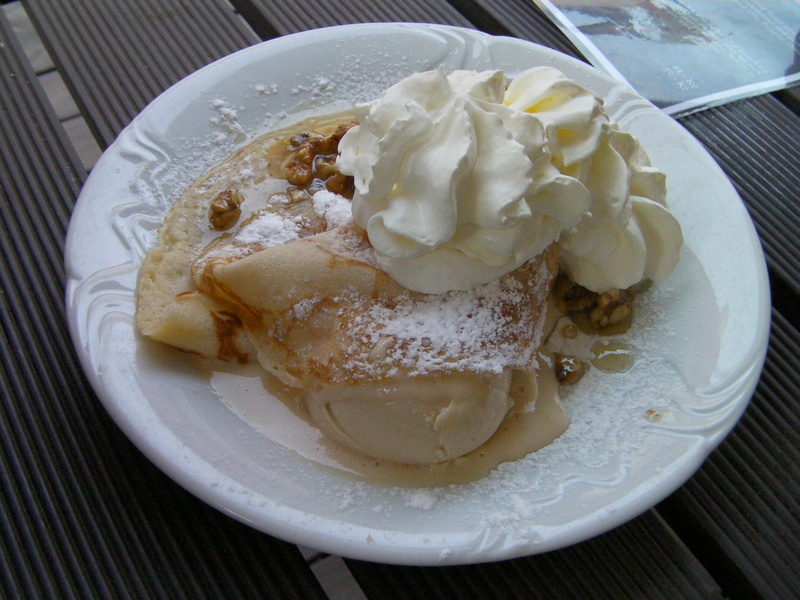 DaddyBird had the pancakes with beer ice cream. I had a little taste of the ice cream and it was yummy. The sun was going down and exhaustion was setting in, so we took the tram home and called it a day.